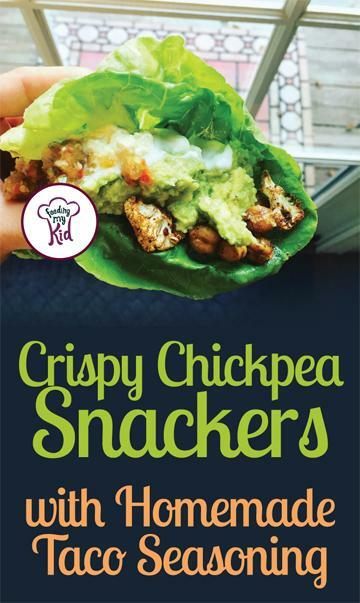 Chickpeas are full of nutrients and you can use them to create healthy snack ideas. These crispy chickpeas are a simple add-in to your kid’s lunchboxes and could also double as dinner! The trick: rinsing and drying the chickpeas really well before roasting. Not bad for something that’s probably hiding in the back of your pantry right now. Healthy snack ideas are within reach with this recipe! The pre-made taco seasoning mixes you can buy at the supermarket aren’t always fresh and can even have additives thrown in. This homemade taco seasoning is simple to put together, super flavorful and only take a few minutes to make. You can even turn this healthy snack into a legitimate dinner! I use lettuce as a wrap, add plenty of crispy chickpeas, cauliflower roasted in the same taco seasoning, then top with guacamole, fresh salsa, thinly sliced red cabbage, a dollop of yogurt and a squeeze of lime. Tacos with a twist! Enjoy. These crispy chickpeas are a simple add-in to your kid’s lunchboxes and could also double as dinner! The trick: rinsing and drying the chickpeas really well before roasting. Makes 2 cups of snackers! Preheat oven to 400º F, with rack in center of oven. To dry the chickpeas, line baking sheet with a clean dish towel, pour chickpeas on top in a single layer and cover with another dish towel. Pat down slightly, shake the baking sheet and pat dry again. Remove the top towel and let sit out for about 5 minutes until chickpeas no longer have a glossy look and feel dry. Remove the other towel, and transfer the chickpeas to a large bowl. Top with olive oil and salt; toss to coat. Using a slotted spoon, lift the chickpeas from the bowl and place in a single layer on an unlined baking sheet, allowing excess oil to drip in the bowl before transferring. If some chickpea skins fall off, just make sure they aren’t scattered at the edges of baking sheet otherwise, they might burn. Roast for 20 to 30 minutes, stirring every 10 minutes until chickpeas are golden brown and crispy on the outside. 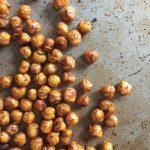 Some chickpeas may pop when roasting, but that’s ok. When crispy, remove from oven and transfer to a serving dish; top with taco seasoning, stir to coat and serve immediately. To turn this addictive snack into a legitimate dinner, I use lettuce as a wrap, add plenty of crispy chickpeas, cauliflower roasted in the same taco seasoning, then top with guacamole, fresh salsa, thinly sliced red cabbage, a dollop of yogurt and a squeeze of lime. Tacos with a twist! Enjoy. 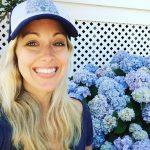 Previous articleHealthy and Delicious Pumpkin Bread Perfect For Fall!